On 2-4 November 2016, UNESCO Almaty took part in the High-level Regional Conference “Common Vision for Agenda 2030 in Central Asia,” organized by the United Nations Development Programme (UNDP), United Nations Environment Programme (UNEP) in conjunction with the Regional Environmental Centre for Central Asia (CAREC) in Almaty. 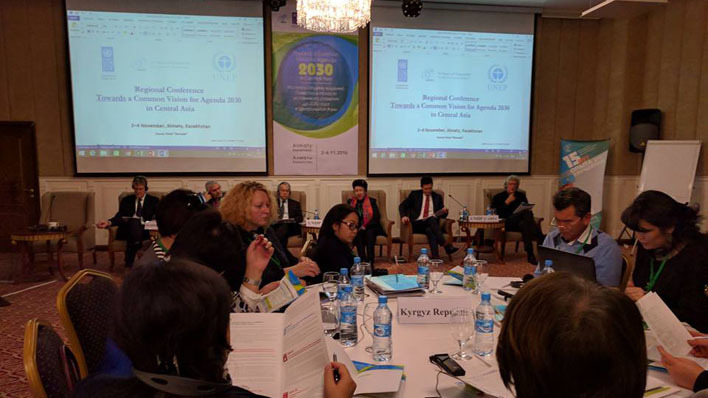 UNESCO Almaty participated in this joint regional conference to contribute to an overall assessment of what has been achieved so far in the dialogue on Sustainable Development Goals (SDGs) in Central Asia and to exchange experiences based on current concerns related to SDGs. In this regard, the event served as a platform to explore opportunities for developing joint regional actions for implementing Agenda 2030, including Education for Sustainable Development (ESD). 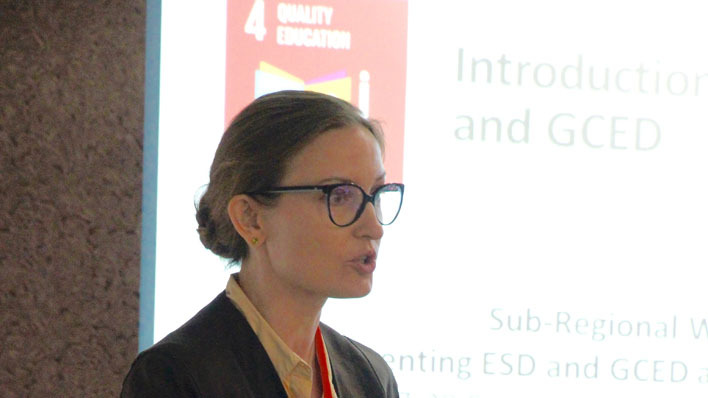 During the event, Lina Benete, International Education Programme Specialist, presented specific plans and partnerships that UNESCO Almaty established to initiate ESD processes and existing initiatives in support of the SDG 4 on quality education in Kazakhstan, Kyrgyzstan, Uzbekistan and Tajikistan. UNESCO Almaty’s past activities on ESD and Global Citizenship Education (GCED) activities aimed at the promotion of tolerance, peace and non-violence education and finding ways to implement ESD and GCED to achieve the global education goal in Central Asia. For example, in September 2016, UNESCO Almaty and the Asia Pacific Centre of Education for International Understanding (APCEIU) organized the Sub-Regional Workshop on Implementing ESD and GCED at local level to achieve target 4.7 of the SDG4. Ms.Benete also touched on the subject of the professional development of educators, advocacy, and awareness raising on SDG4, ESD and GCED in Central Asia in the coming years. The ongoing tasks of the Education Unit of UNESCO Almaty include: organization of the Sub-Regional Meeting on Education 2030/SDG4 in Central Asia, establishing the working group to prepare for trainings on ESD and GCED; developing training materials, and using “Change Project Approach” to enhance education quality and relevance by supporting ESD practices through teacher education. The three-day Regional Conference brought together Central Asian and international partners: representatives of national authorities responsible for different sectors, SDG focal points within government and UNDP Country Offices, policy makers and technical experts in SDGs, educators from governments and NGOs, and regional organizations involved in the implementation of Agenda 2030.